A backpacking tarp is an excellent means of getting closer to nature. Besides, a tarp is the favored option among the backpackers who are seeking the lightest possible gear. They are inexpensive yet straightforward, and highly adaptable. 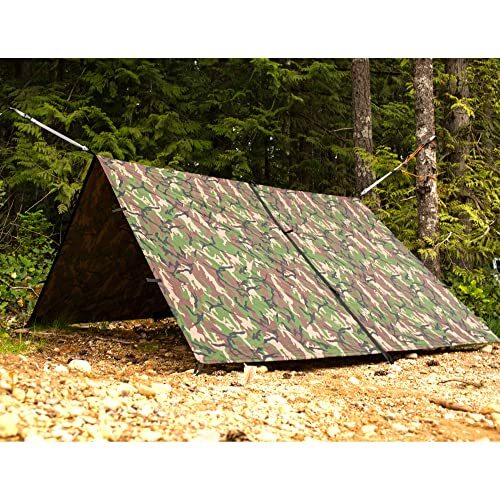 It is a good option for you to cut down the weight, tarps are the lightest portable shelters. But out of all the options, which one is the best backpacking tarp? Here, we have done the hard work for you and selected the best backpacking tarps available on the market. For a backpacking or hiking adventure, you need to think about the shelter that makes the most sense. The best option is backpacking tarps. They are light-weight, waterproof and made of durable fabrics. They are also simple to use and versatile, and you can purchase in sizes from solo to group uses. But which one is the best backpacking tarp available in the market today? Our experts have made a list of ten best available backpacking tarps available. Let’s find out the best option for you! This tarp is an excellent backpacking tarp for a beginner, or for anybody who prefers durability over light-weight. The tarp has plenty of tie-down points, you can use this in a straight downpour rainstorm, and it will keep dry. The trap is constructed of sturdy, waterproof material and it is super easy to set up. You can use this for hammock camping. It is a beast, large and strong. The size is very versatile, and you can pick your preferred option from the three sizes available. This tarp also comes with excellent stakes, guy lines, and storage bag. 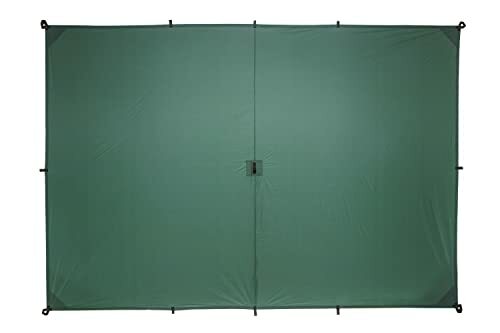 This tarp is available in the 12 and 9-foot size. And you can set up them in so many different ways. The Kelty Noah’s Tarp weighs about 34 ounces or 2 lb. Overall, this tarp is perfect for a casual camper/occasional backpacker. The Chill Gorilla 10′ tent tarp is lightweight, durable, tear and puncture resistant. This tarp is perfect for rain flies as it will not fail under stress. This tarp offers 9 tie downs, 2 centerlines and includes stakes, ropes, and tensioners. This rain fly tent tarp is truly a waterproof tarp, and its 170” diagonal ridgeline keeps you dry. Its square design offers more coverage and more setup options. 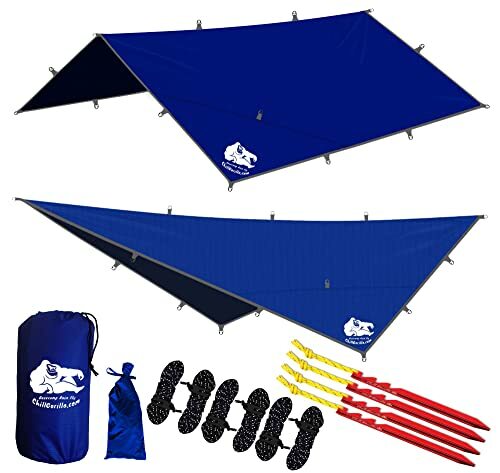 You can use this tarp with double hammocks, mosquito & bug nets, camping, tents, fishing or as an ultra-light sun canopy. It fits comfortably in your backpack. The Chill Gorilla 10′ tent tarp is made of Polyurethane-treated rip-stop nylon that offers long-lasting protection and is perfect for sudden downpours, or emergency shelter. 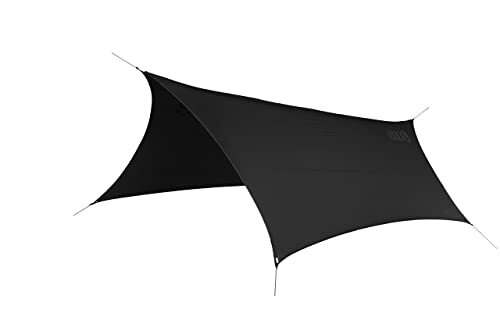 Its square shape with 9 guy points provides you the ultimate rain fly with a 170′ inches centerline, and you can be pitched in multiple configurations. This hammock tarp is ideal for hiking, camping, cycling, boating, festivals and traveling. Easy installation, sets up in minutes. This tarp comes in a rainproof gear sack. The Aqua Quest Defender tarps are perfect for camping, emergency survival, or you can use it as an awning around your home. You can keep this multifunctional tarp in your car, motorcycle, boat, or hovercraft, and be prepared when you need it. There is no better tarp other than this one for defending yourself against the elements. The Defender is incredibly durable and resilient to the forces of nature. It is constructed of 70D Rip-Stop nylon integrated with heavy TPU coating, reinforced stitching and heat taped seams. The Aqua Quest Defender tarp is 100% waterproof and will keep you dry, even in extreme weather. As it has a hydrostatic resistance of 20,000 mm. The Defender Large 13 x 10 ft boasts a total of 25 reinforced webbing loops with five along the ridgeline, plus pole inserts in all four corners for you providing nearly unlimited set-up options. The Defender comes with its stuff sack and packs up small. This product also covers two years warranty. For tremendous coverage durable performance, this hammock suspension system is an excellent option. This hammock provides comfortable support as it is constructed from ultra-strong breathable nylon with triple stitched. This hammock suspension system is an excellent choice for those who are looking to keep pack space to a minimum. This hammock is ideal for camping out, versatile, lightweight backpacking, or motorcycle trips. Its Polyurethane-treated ripstop 210D nylon offers long lasting all weather protection. The soft, flexible parachute material offers you a comfortable night’s sleep. Waterproof Rating: mmH2O rating is 2000mm. Carabiners, suspension straps, and hammock are included. It also includes Guy lines, high-quality aluminum stakes, and a carrying pouch. Each hammock comes with tree friendly straps. Weighing in at around 2 lbs. This hammock is small enough to fit in a small backpack pocket. The manufacturer also offers a lifetime limited warranty. Carabiners, suspension straps, and hammock included. Tree straps are very short. 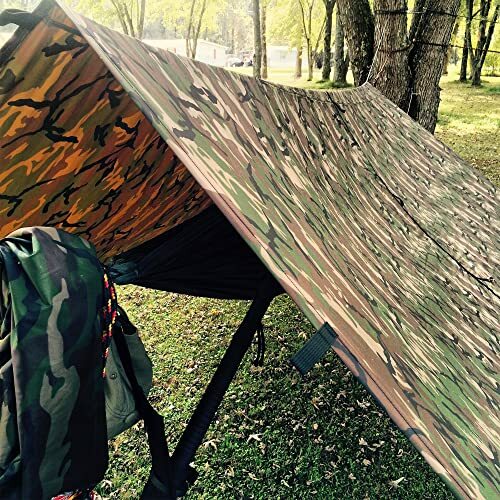 The ENO ProFly is a rectangular, lightweight tarp designed for hammocks, but you can also use it as a shelter or sun shade for multiple purposes. ProFly Rain Tarp is a budget backpacking tarp. This tarp is reinforced on the edges with grosgrain, and it has a plastic LineLoc device on each corner. This is a great backpacking tarp, and you can use it for hiking, mountaineering and as an emergency shelter. The tarp is constructed of polyurethane-treated 210D rip-stop nylon. This kind of material offers great weather protection. The ProFly tarp is outfitted with six attachment points so that you can easily secure the tarp. 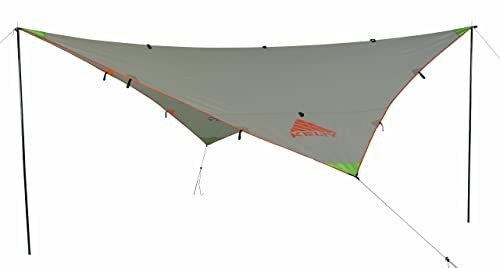 This rain fly tarp is big enough to cover your hammock, offers an excellent balance between footprint and coverage, and better than that of ENO’s other rain flies. Overall, this tarp is a quality product, which is reasonably priced. The Defender is one of the most heavy-duty of performance tarps available in the market, and it has a proven record of resilience and durability. 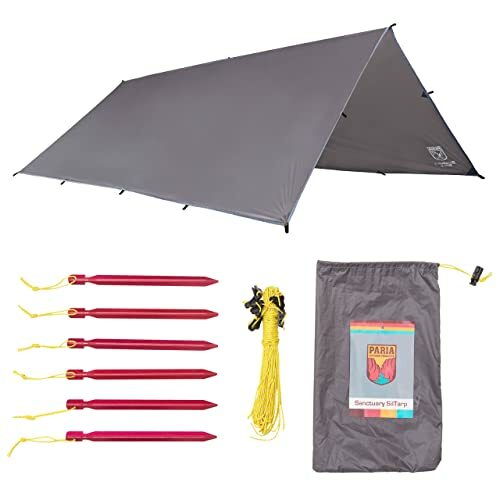 This best backpacking tarp is constructed of sturdy 70D nylon with a dual DWR and TPU coating. You can also set it up in virtually any situation, and you do not even need trees. The Defender is a compact, versatile, longer lasting, and waterproof tarp. The ‘Defender’ will keep you dry, even in a heavy shower with a hydrostatic resistance of 20,000 mm. The Defender is incredibly resilient and durable to the forces of nature, even after extended use. The tarp comes in a convenient stuff-sack, and packed size is 12 x 6 x 2.5 inch. 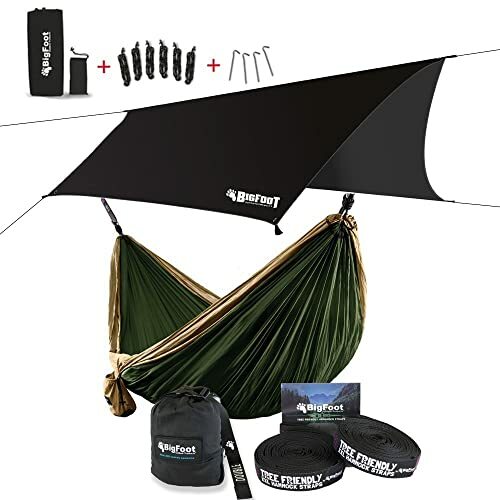 It has 20 reinforced webbing loops around the perimeter, one top center loop for overhead hanging, and pole inserts in all four corners, so you have got all angles covered. This tarp also covers two years no worries warranty. They provide everything you need for the perfect shelter. With the purchase, you are getting a silicon-nylon tarp, six micro line-lock adjusters, 60 feet (6 x 10-foot sections) of reflective Dyneema guy line and six aluminum Y-stakes. A total of 6 perimeter attachment loops, hex shape, and catenary cuts provide you the perfect hammock shelter. This product also covers a limited lifetime warranty. To keep yourself dry in any weather condition, this tarp provides 5,000 mm of hydro-static resistance by integrating a 30 denier rip-stop nylon with a dual silicon/PU coating, and fully taped seams. Each tarp comes with 60-foot of 1.5 mm reflective Dyneema guy line, six aluminum Y-stakes and six micro line-lock adjusters. This tarp weighs only 16.5 ounces, while the whole kit is only 20.5 ounces. The full kit comes in a compact stuff sack to save space. Each tarp comes with 60-foot of 1.5 mm reflective Dyneema guy line, six aluminum Y-stakes and six micro line-lock adjusters. Aqua Quest Guide tarp fabrics and coatings build a waterproof shield with an incredible hydrostatic resistance. The Guide Tarps are made of robust fabrics, constructed to last. They are constructed of 40D Rip-Stop fabric with Non-toxic dual Silicone & PU coating plus Reinforced stitching and Heat taped seams. With a hydrostatic resistance of 20,000 mm, they will keep you completely dry, even in severe weather condition. They have come with heavy-duty webbing loops, heat taped seams and reinforced stitching to perform and protect in rugged conditions. The Guide is the most lightweight backpacking tarp by Aqua Quest. The Guide packs up so small and weighs only 1.9 pounds. This tarp provides up to 122 square feet of dry ground, yet packed Size is 12 x 6 x 3 inch and Compressed: 6 x 6 x 3.5 inch. It comes in its convenient stuff-sack. Despite being so lightweight and compact, the Guide is incredibly durable to the forces of nature. 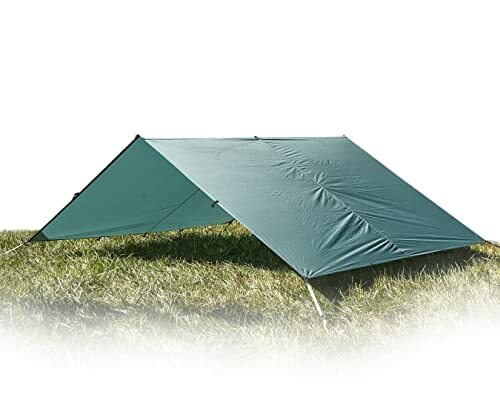 The Aqua Quest Guide tarp is made of Silnylon with five tie-outs on each side. It is 100% waterproof, as the Guide tarp has a hydrostatic resistance of 20,000 mm, so this tarp will keep you dry, even in extreme weather. You are getting a product that will work for you in most situations. And you will also like the low price and versatility offered by this tarp. The Guide 10×7 ft weighs only 17.6oz only 1.1 pounds and packs up so small. So, you can pack it in a small space and you will hardly notice you are carrying it. Though it is lightweight, it is incredibly durable and flexible to the forces of nature. It is made of 40D RipStop fabric, Non-toxic dual Silicone, and PU coating. It has Reinforced stitching and heat taped seams. All these materials and features made this tarp tough and durable. This tarp also covers a limited warranty. Chill Gorilla produces quality gear to make sure you are protected & covered in the outdoors. 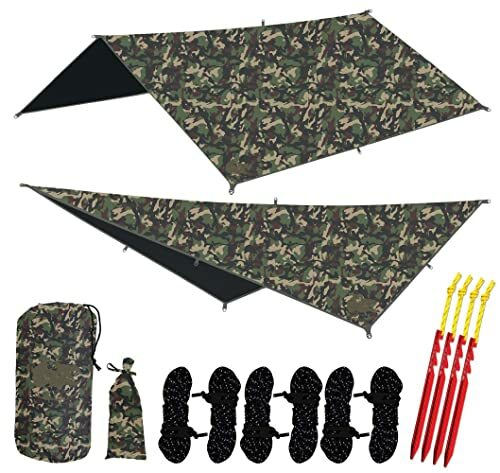 This 12 ft hammock rain fly tarp is made of advanced premium materials to work in all conditions. This is a durable yet lightweight, tear & puncture resistant backpacking tarp, ideal for rain flies that will not fail under stress. The tarp is constructed of Polyurethane-treated rip-stop nylon that offers long-lasting protection. This hammock tarp is ideal for, camping, backpacking, hiking, boating, sporting events, festivals and traveling. It has 19 tie downs for multiple anchoring points, offers easy setup. There are metal D-loops on both ends and nylon loops along the top to run the ridge line through. Its Square shape 19 guy points offer you a long 203 inches centerline and 144 SF of protection. This tarp comes in a rainproof gear sack. Overall, it is practical, reliable, lightweight and durable backpacking tarp. To bring you the best information possible, we choose ten best and popular backpacking tarps from a vast initial selection. As there are different designs of ultra-light, waterproof backpacking tarps available today. Our experts did their best to characterize the widest breadth of options to help you understand the positives and negatives of each product. We hope that this review article has helped you to pick the best backpacking tarps for your needs, and we also thank you for reading. Happy Camping!